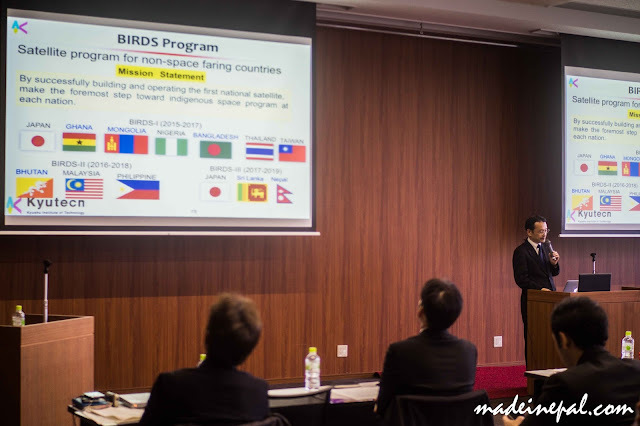 Prof. Mengu Cho, the Principal Investigator for BIRDS, gives an overview of the project. Since Nepal's official involvement in BIRDS-3 Satellite Project [HERE] and [HERE], official facebook page [HERE], the team has been looking into ways to add more members to the Nepalese team. As of now, there is only one member. A minimum of two is required. For that, close talks with Nepal Academy of Science and Technology (NAST) is underway to find creative ways to fund one or more students. In the meantime, Kyutech has also been finding ways to fund a student from Nepal. After the Post Graduate study on Nano-Satellite Technologies (PNST) under the UN/Japan Basic Space Technology Initiative (BSTI) Fellowship was renewed this year, Kyutech has decided to award one slot from 3 PhD. or 3 Masters slot to Nepal. This has been done with an understanding with NAST and that NAST pays the satellite hardware costs by February 2018. All interested individuals who are under 35 years old and are 10% of their graduating class can follow the link [HERE] for further information. The deadline for application is on 28th January, 2018 for October 2018 intake. Applicants with hands-on experience on embedded systems design are preferred as the team needs someone who can come in and work right away. Please refer to the end of the blog post for criteria.